Hi Everyone! Preparations are already started for our son's birthday coming up. We are so proud of him and all the changes that are happening in his life and the wonderful young man he is becoming. I will be making a birthday post in his honor soon. 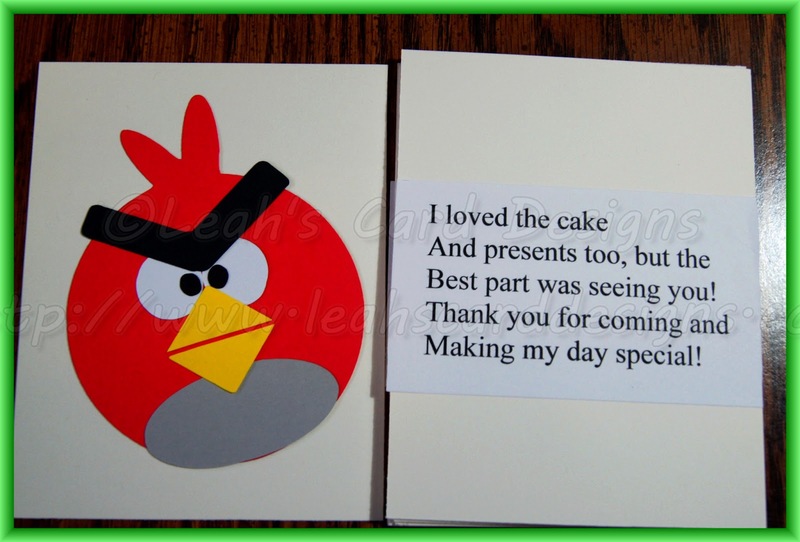 I thought with keeping with his theme for his birthday; the Angry Birds. I thought I'd have the thank you notes made in the same theme as well. I will have a picture of the cake coming later this week as well as the cupcakes. I will have a variety of the snacks and other special things later this week. but the best part was seeing you! These our son can sign at the bottom in his own writing. I thought I'd give them to the guests at the end of the party so they have their thank you right away. I know that is a bit different, but thought it would still be good.